There is little doubt that Paul Flynn presented a firm image to many voters. The match report describes it as “entertaining” when the team drew 18 – 18 with Isuzu Southern Kings in the Guinness PRO14 tournament at Port Elizabeth. 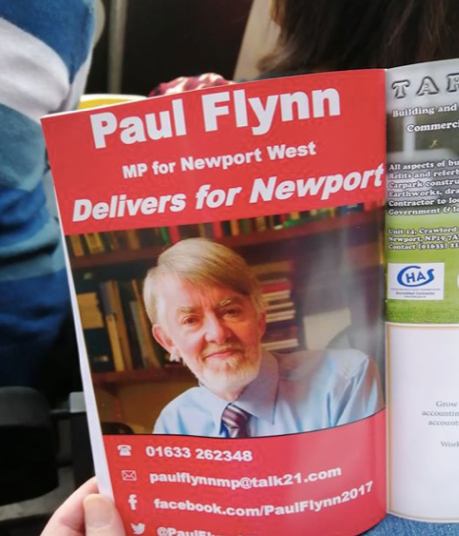 It was also entertaining to read in the programme that Paul Flynn was the MP for Newport West and “delivers for Newport” offering contact details even though he had died on February 17. Rugby fans might have been better contacting the present MP for Newport West, Ruth Jones, who was elected on Thursday. Yesterday’s match report also said time was “running out” and it sadly did for Mr Flynn. But we are sure he would have been comforted to know he lives on in the minds of rugby fans! Tomorrow – why a crooked South Wales ‘Estate Agent’ who has fleeced ‘customers’ of thousands of pounds and was exclusively exposed by us, now says he will not deal in property. Also on The Eye – a spoof Press Release from Wales’ biggest airport to the mainstream media congratulating journalists for not reporting they had linked up with a country accused of supporting terrorism or that millions of pounds were paid before the state was controversially awarded the football world cup. Our Editor Phil Parry’s memories of his extraordinary 35-year award-winning career in journalism as he was gripped by the incurable disabling condition Hereditary Spastic Paraplegia (HSP), have been released in a major new book ‘A GOOD STORY’. Order the book now! The picture doubles as a cut-and-paste poster!